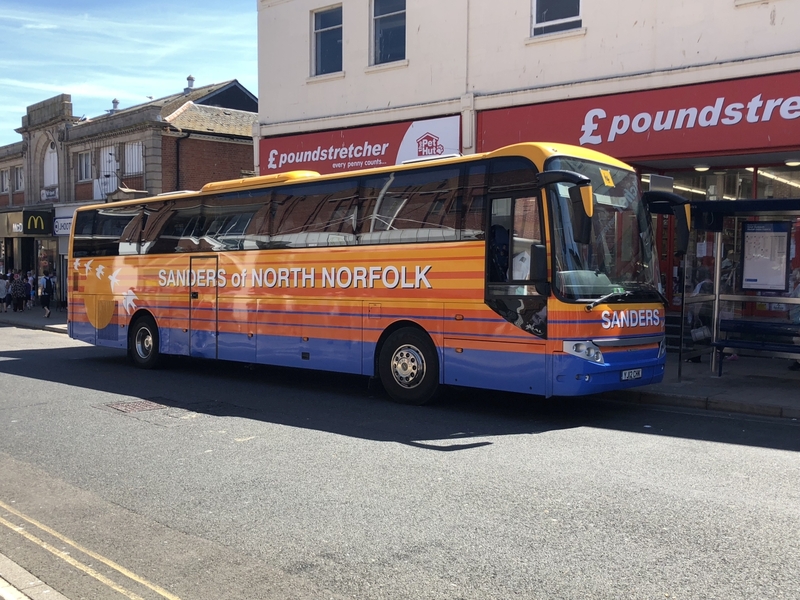 An early visit to Great Yarmouth this morning, following a 'taxi duty', revealed a few coaches in the holiday area with some returning home today following their short breaks. A look in at Beach Coach Station found five examples including two Alfa Travel fleet members parked in an awkward position for a reasonable photo. They were Mercedes Benz Tourismos 83 BX14LCM and 106 BN17JDF. Also there were two Gee Vee Travel Bova Futuras GT07GVT and YD02PXV with Edinburgh based AAA Coaches providing the filling in the sandwich with their David Urquhart branded VDL PM18AAA. Another unrecorded David Urquhart liveried AAA Coach was noted on Kings Road. Returning via North Drive, an unmistakable Johnsons' liveried Plaxton Panther bodied Volvo B11R YX16NYB was parked outside the Burlingham Hotel. The last photo shows Shearings' Mercedes Benz Tourismo 134 BU18YSL awaiting the loading of luggage and passengers prior to departure. The 18 plate coach is becoming a regular visitor to the town. The second of the two First Great Yarmouth Geminis, due to leave for First Essex later today, will not now head south until the weekend. This morning 32672 SN55HEV was seen in Gorleston High Street being employed on the 8 between the James Paget Hospital and Caister’s Second Avenue. My thanks to First Great Yarmouth for the update. Sanders Coaches is to alter the route and timetable of its 56 Holt to Easton College service from 2nd September 2018. 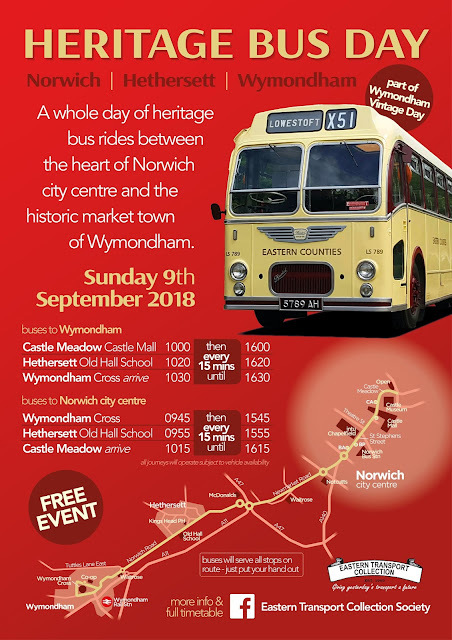 The operator is also to change the timetable of its 35B Swafield and Cromer route plus the 16/18/18A/19/20 and 79 group of services between Aylsham and Holt on the same date. There has also been an application from Mr Simon Birro for an operating centre for one vehicle at Post Office Road in Knodishall near Saxmundham. The full report will be available soon on the Traffic Commissioner's website. You will have already read from Saturday's post (On the Move - 25th August 2018) that two Wright Eclipse Geminis were/are leaving First Great Yarmouth for First Essex. This in turn releases two low height deckers for transfer to Ipswich with 32652 AU05MUP and 32654 AU05MUW assisting with new school work amongst their other duties. Both were to be seen in the Great Yarmouth and Lowestoft area at one time. 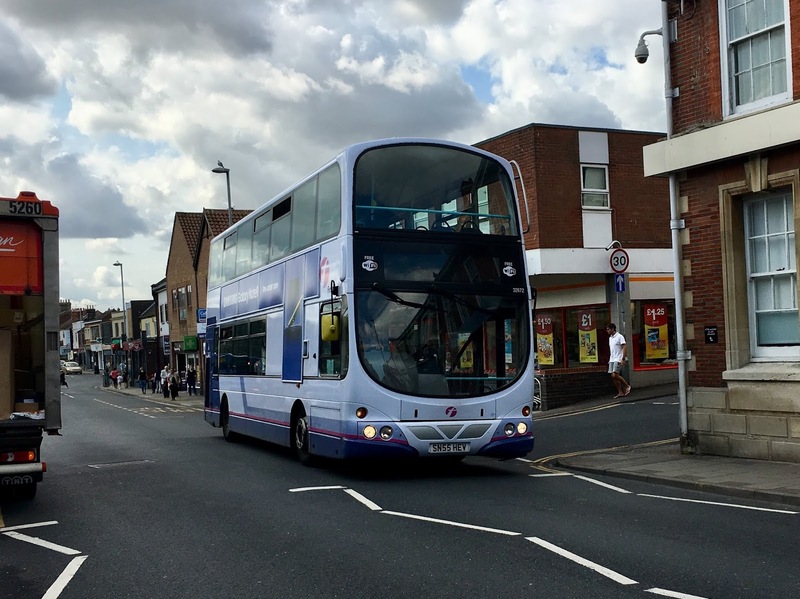 Another 12 plated Volvo B9TL is due from Leeds next month which is due to replace the current 36271 BG12YKD on loan from Norwich. 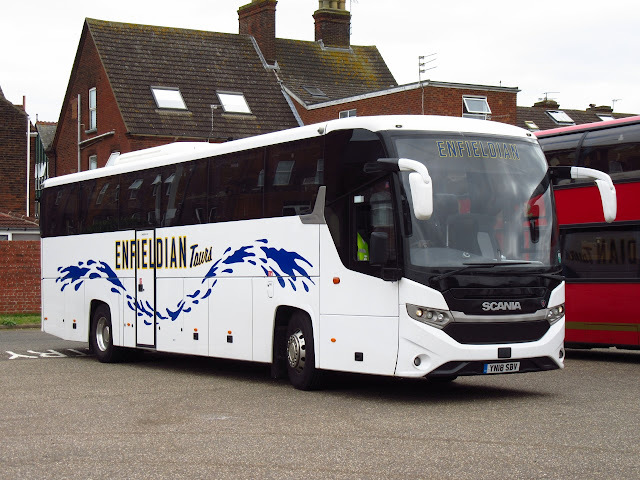 This was provided to cover for the Excel Enviro400 sent to Kings Lynn. Also on the move are two B7RLE's from First Essex to Norwich to cover for an increase in the PVR from 16th September (University journeys plus the 38A to Harleston). These are 66822 MX05CEO (currently undergoing a tidy up) and 66824 MX05CEV. Finally another Volvo B7L is due to be allocated to the training fleet soon. This morning was disturbed by the noise of the East Coast Truckers sounding their horns whilst passing through the town on their way to Pleasurewood Hills. The event is arranged by the Truckers' charity raising monies for the many disadvantaged children in East Anglia. Again some 80 trucks took part in the run from Norwich's County Hall. This year Sanders Coaches provided the support vehicles with three coaches involved. One of them, Plaxton Paragon bodied Volvo B12M 3990ME, appeared towards the procession whilst the others continued direct to Pleasurewood Hills. They were Jonckheere bodied Volvo B12BT OGR647 and VDL/Berkhof YJ12CHK. 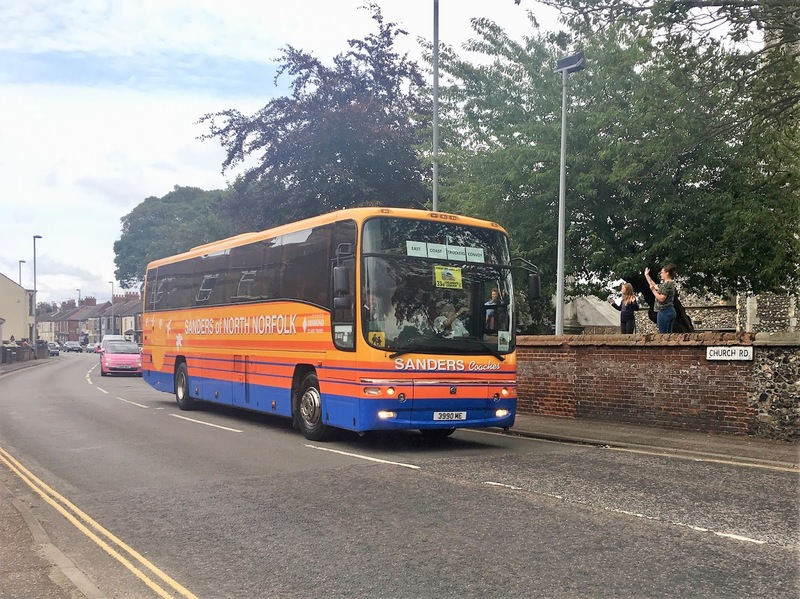 I understand from social media that it would be the last time that the VDL would be operating for Sanders Coaches as it was reported to have been sold. The latter left this morning for Chelmsford whilst the former is expected to leave later this week after completing its MOT at Caister Road. 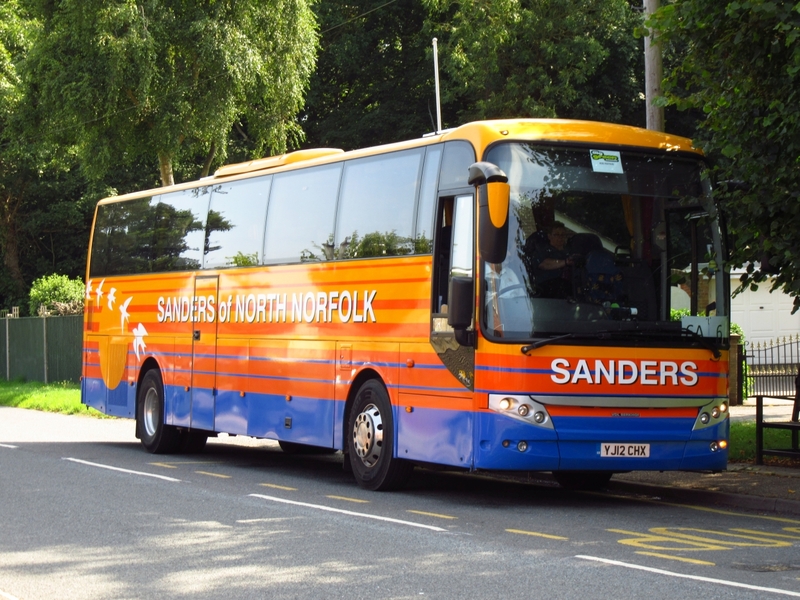 Couple of shots taken today of Sanders Six service which runs from North Walsham to Great Yarmouth. 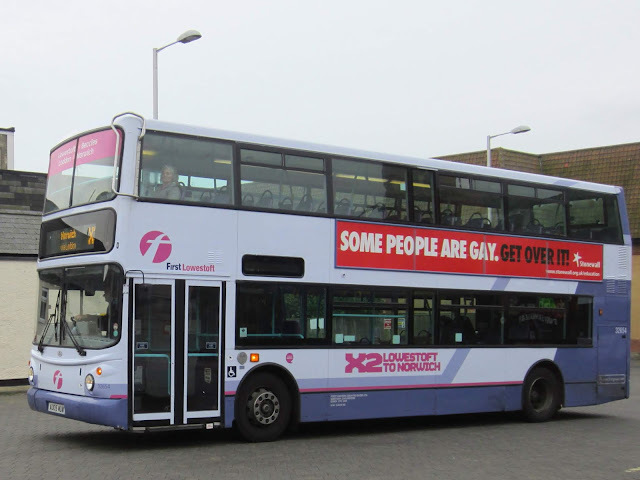 First up is Volvo B7RLE DK09DZD which is seen here outside the Church in Caister on Sea heading for Yarmouth. Next up is DAF/Berkhof Coach YJ12CHX working the 6A back to North Walsham, seen here at The Green in Ormesby St. Margaret. Sunday saw a brand new event at the East Anglia Transport Museum. The 999 Emergency Services Day brought together examples from all four local emergency services providing various displays and demonstrations throughout the day. BorderBus provided the Park and Ride service linking a new venue for the car park at Pakefield with the Museum. Scania OmniCity BB06BUS operated the service. The event also provided the opportunity to make use of the adjoining land at the museum which was acquired a couple of years ago. the land for the construction of exhibition depots, roads and tram tracks with overhead wires and ancillary street furniture plus narrow gauge railway tracks, carriage shed and platform. The photo shows the view from the site looking eastwards towards the Museum showing London Transport trolleybus 1201 parked outside the existing trolleybus depot. 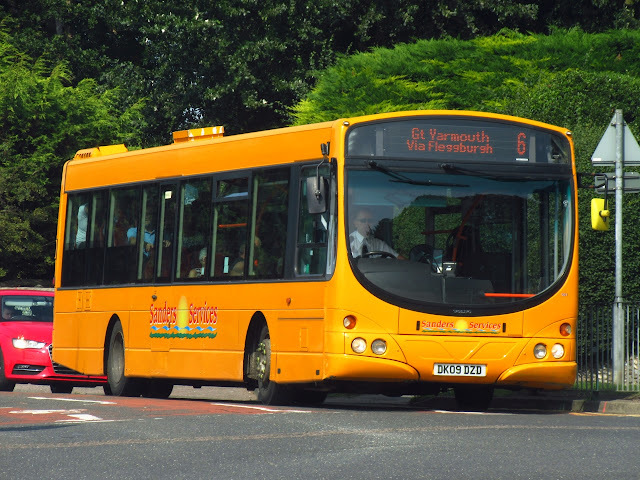 Sanders Coaches has numerous entries in today's Notices and Proceedings Report published by the East of England Traffic Commissioner. 4 Cardogan Road, Cromer and Wells-next-the Sea (Quay). 5 Charles Road, Holt and North Walsham Post Office. 5A Cromer and Norwich Bus Station. 6 North Walsham Post Office and Great Yarmouth Market Gates. 6A North Walsham Post Office and Cromer Bus Station. 9 Holt Market Place and Oak Street, Fakenham. 34 North Walsham Post Office and Stalham Former Rail Station. 43/43A/43B Reepham Market Pace to Norwich Bus Station. 44 Hempstead Road, Holt and Sheringham Station Approach. 45/45A Holt to Norwich Bus Station. X11 Happisburgh Post Office to Norwich High School. X44/X40/44A Reepham to Norwich High School. X55/55 North Walsham Post Office to Norwich City Centre. First Eastern Counties is to amend the route, stopping places and timetable of its 915/917/918 services between Sycamore Drive in Rendlesham and Farlingaye High School from 2nd September 2018. Thirty four years ago today, at 5:30 am, a fire took hold of the Fullers Hill premises of Norfolk Motor Services. 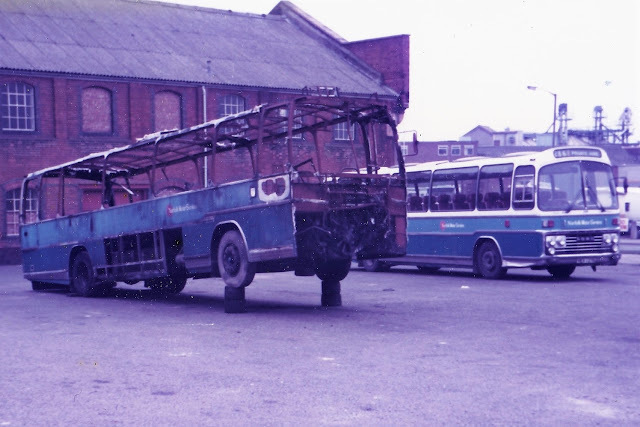 Four coaches were badly affected by the fire and research by Robert Kelly has identified them all as Plaxton bodied Fords. Three of them were R1114 models (UBE616T, DEX623T and SVF510W) with the fourth (CPW139T) being a Ford 1014 which can be viewed here. 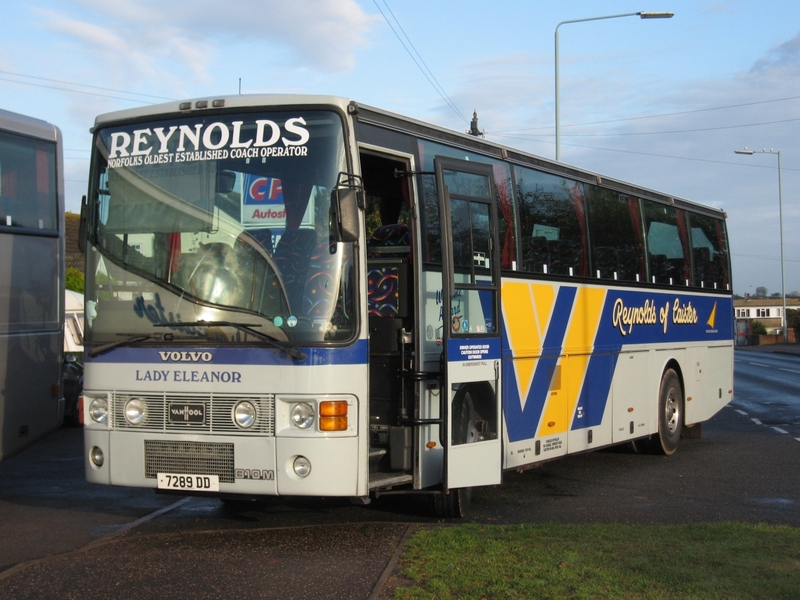 SVF510W was later sent to Plaxtons to be rebodied and was later sold on to Anglian Coaches where it stayed until April 2000. 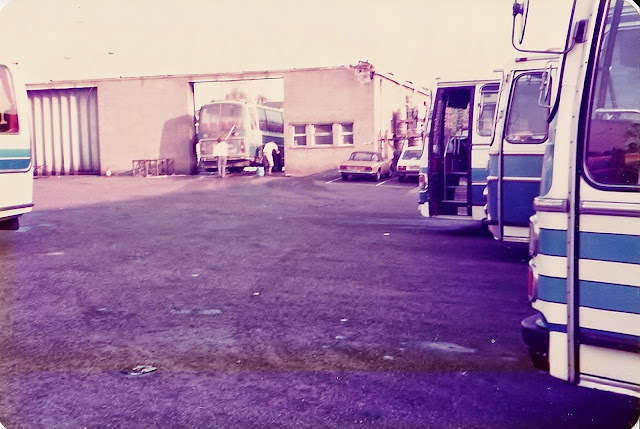 As for Norfolk Motor Services they moved to temporary premises on Southgates Road in the autumn of 1984 and were subsequently sold on to the Diamond Jersey Group which ceased operations in March 1985. Colin Oakley on Twitter recalls a Norfolk Motor Services holiday in 1977 which was based in Dunblane (near Stirling). Night stopped en-route at Shap going out and Newcastle back. Got as far north as Balmoral. Coach was REX580K, Plaxton bodied Ford R226. The latest news from First's Caister Road depot is that four deckers are expected to leave the fleet soon - two will move to First Essex and two are for withdrawal. Further details to follow. On the repair front President 32206 LT52WTM is still awaiting the installation of another engine whilst one of the Wright Eclipse saloons is to become a training bus following the transfer of Volvo B12M 20514 WV02EUP to First Essex. With the need to spend a penny I thought I would look in at the bus station and was rewarded with a photo of Whippet's National Express branded Caetano bodied Scania K410EB6 bearing the registration BV67JKN. New to the Swavesey based operator in January this year, it was being used on the 727 London Gatwick route. A Busy Saturday at Beach Coach Station today, i passed around lunchtime with no less than 31 Coaches in attendance, these days an unusual sight! First up is AA66UKA A Volvo B11R, Plaxton Panther of Hamiltons Coaches, Desborough in Northamptonshire. 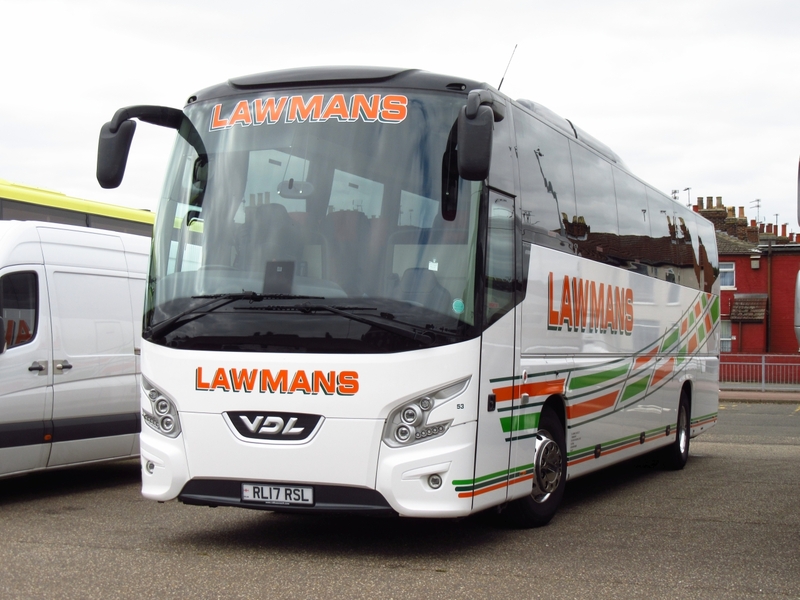 Next up is Lawmans VDL RL17RSL which is numbered 53 in their impressive fleet. 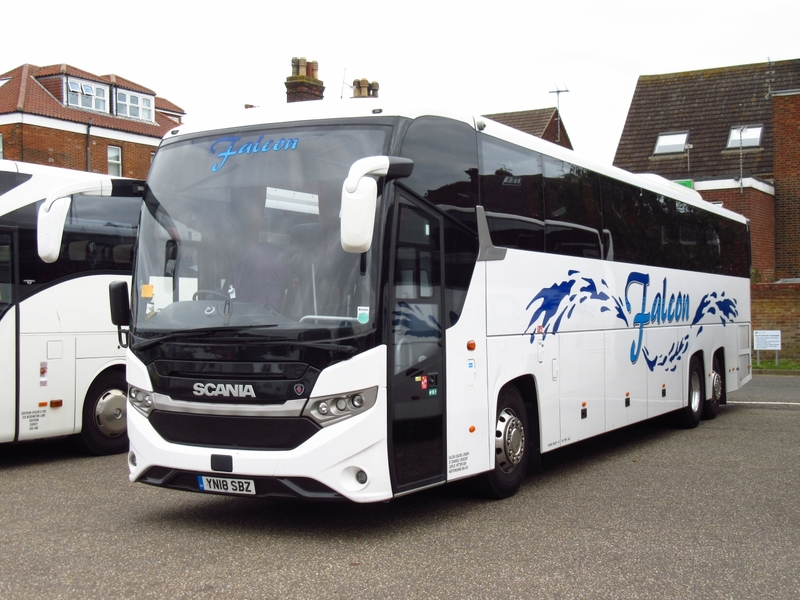 The first of two new vehicles noted for Falcon Coaches , Potters Bar was Scania YN18SBZ this was parked up alongside sister vehicle YN18SBV which was carrying Enfieldian Tours livery. A further vehicle in the Falcon Fleet was also in attendance, that being Volvo/Sunsundegui BF65WKM. 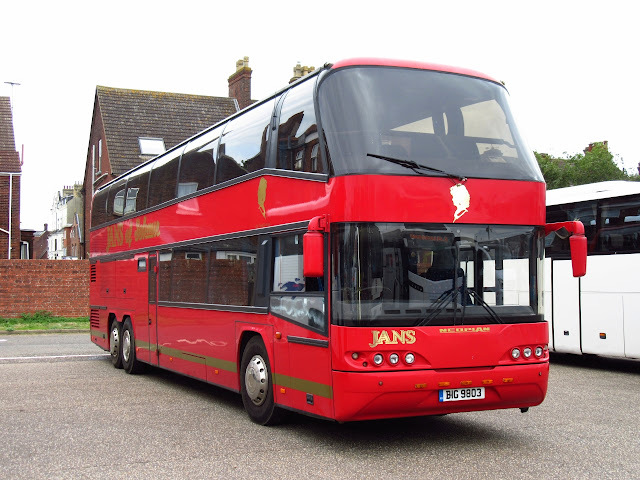 Last up is a slightly older vehicle, Neoplan Skyliner BIG9803 belonging to Jans of Soham, It was new as YN56BGE. 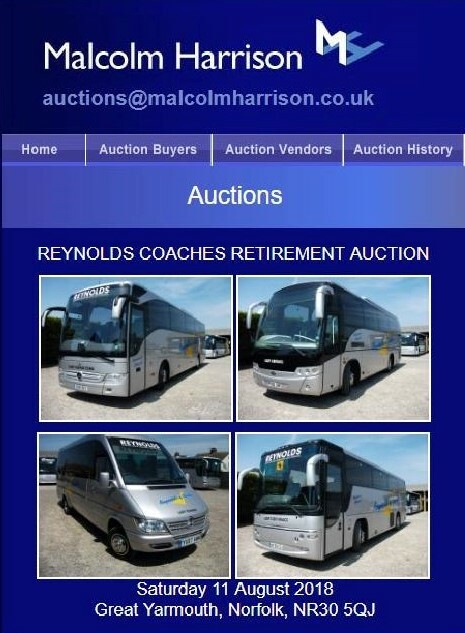 Previously with Hodsons Coaches and was new to Marchants of Cheltenham in 2006. 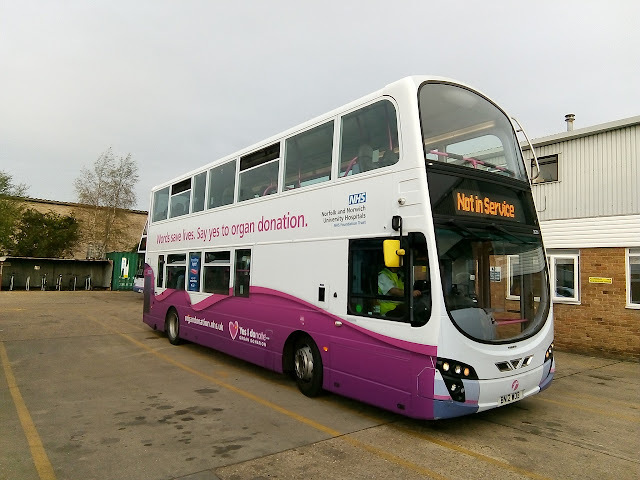 First Norwich based Volvo B9TL 36201 BN12WOB has gained an allover wrap for NHS Organ donation in conjunction with the Norfolk and Norwich University Hospital. 32201 is Pictured above at Roundtree Way Depot about to head out into service. Many thanks to Samuel Stelling for the photograph. 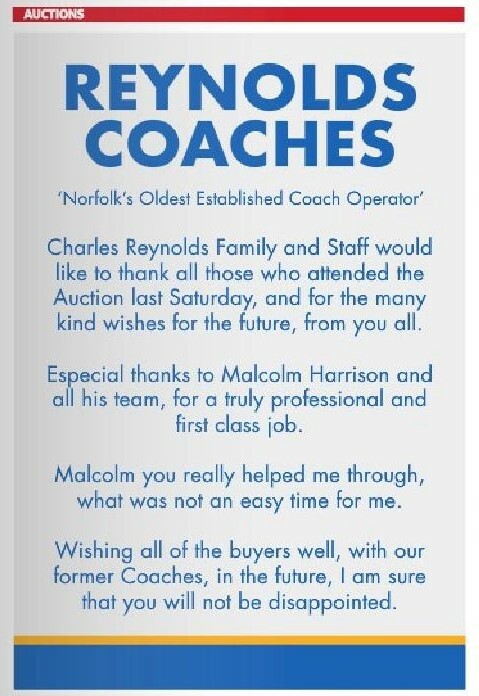 I understand at least one of the operator's former coaches is to remain in the East Norfolk area and further details will be revealed soon. This morning's Notices & Proceedings Report contains numerous entries affecting local bus operations. First Eastern Counties is to amend the timetable of its 14/15/15A services between Wymondham and Wroxham, Blofield Heath, Lingwood and Acle from 16th September 2018. BorderBus is to amend the routes and timetables of its SL6 and SL7 services to Sir John Leman School in Beccles from Southwold and Oulton Broad respectively from 7th September 2018. NNCT1 Tuttington Church and Aylsham Market Place. NNCT2 Aldborough Green and North Walsham Market Place. NNCT3 Aldborough Green and Hoveton Roys Department Store. NNCT4 The Poplars/Swanton and North Walsham. NNCT5 North Walsham/ Roys Department Store and North Walsham. NNCT6 Hoveton Roys Department Store and Hoveton Roys Department Store. NNCT7 Little Barningham and Oulton. NNCT8 North Walsham and North Walsham. NNCT9 East Ruston and Stalham or Wroxham. NNCT10 North Walsham and Trunch. NNCT11 Worstead to North Walsham. NNCT12 Worstead and North Walsham. Michelle Cushing has applied to use premises at Englands Lane in Acle as an operating centre for two vehicles. The licence of Forget-Me-Not (Travel) Limited (Directors: Anthony Soames, Mandy Soames and Andrew Soames) has been revoked with immediate effect. The first couple comprised Alpha Travel's Mercedes Benz Tourismo BX14LCL and Bucklands Omnibus Volvo P78OEW. The latter is a Plaxton bodied Volvo B10M acquired from Forget-Me-Not Travel (Soames) in 2016. The other twosome was formed by Simonds' Van Hool bodied Volvo B12B 98TNO and Neals' Volvo B13RT OIG6927. The former was new to the Diss company as YJ05XWV in June 2005, whilst the latter was previously with Lochs and Glens as their BX12CUK. For those who feel they have overdosed on Reynolds Coaches here is something completely different! During a quick tour around, I found some coaches of interest at Beach Coach Station, the first being Peelings Coaches' Volvo B12B B12FAH. 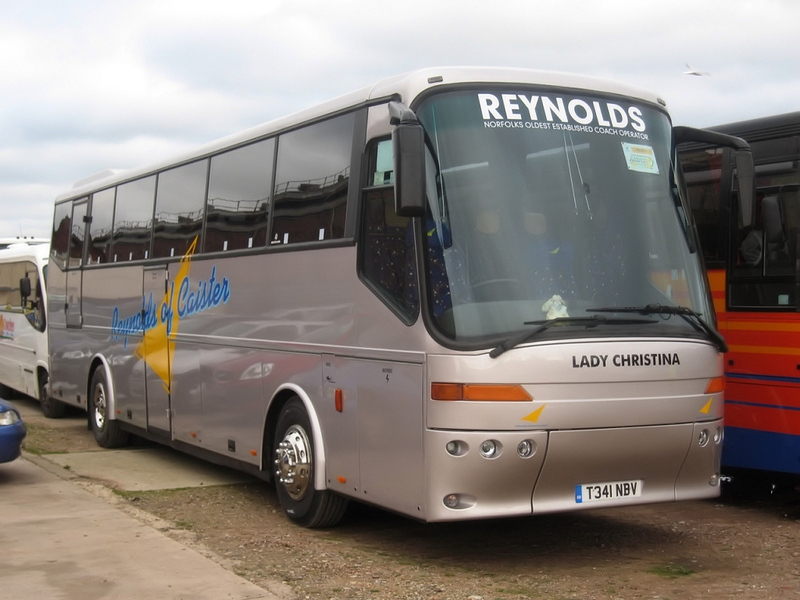 The coach is the second reincarnation of the registration, having been new to Country Lion of Northampton in 2007. Another 'local' was Norse's Plaxton Prima bodied Dennis Javelin 7182 YM51WDY, but what caught my attention was two NH plates; Essex based Horizon's NH09LRH was a Setra 415GT-HD, previously with National Holidays, whilst similar NH11CTH is still very much with National Holidays. My final visit was to Caister Road to see what was on the forecourt and one of the First ALX400 bodied Volvo's recently transferred from Greater Manchester was on display. In fact 30961 YJ51RDV still retains the First Greater Manchester fleet name above the entrance. Something I hadn't notice before. My thanks to Jonathan Joplin for the updated information regarding his B12FAH - these cherished number plates can be a minefield at times! 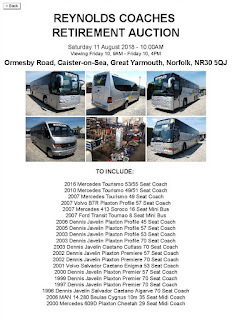 Well today sees the hammer coming down on Reynolds Coaches of Caister, The Auction to sell off the fleet is today so i thought i would share some of my photos gathered over the past few years showing some of the many types of vehicles operated by this celebrated Norfolk operator. First up is DAF/ Caetano Algarve BEZ3135 which was new as K796VPJ, pictured in April 2005. 7289DD is a Van Hool bodied Volvo B10M and seen here at the garage in October 2009, It was aquired by Reynolds in 2001 and was new as H595EBX, It was refurbished in 2012 and repainted into the current silver livery and had a name change from Eleanor to Samantha. Bova Futura T341NBV was aquired in late 2008 and is pictured above on one of its first outings to Carrow Road for a Norwich City matchday. It went on to gain cherished plate BIG6620 and also a slight name change albeit one letter from Christina to Kristina! Final one for this part is Mercedes Benz minibus PIL6595 Lady Grace, seen here at Ormesby Road in June 2007 wearing a rather fetching matt grey livery, it was withdrawn not long after this photo was taken. This morning I visited Reynolds Coaches Ormesby Road depot for the very last time to see all the 'Ladies' on their viewing day prior to the auction tomorrow. I was impressed with the very professional way it was being handled with all employees smartly presented in their new yellow Hi-Viz tabards with 'Reynolds' emblazoned on the back. Similarly all the coaches were smartly presented both inside and out; something you would expect from a well run and respected company. I spoke with owner Charles Reynolds who had been onsite since 6 this morning and he was still very much involved with things by speaking to visitors and well wishers. My thanks to auctioneers Malcolm Harrison for allowing me to take photos and to Charles for sparing the time for a chat. We would like to wish Charles all the very best in his retirement. Tomorrow sees the end of an era with the Reynolds Coaches Retirement Auction being held at the company's Ormesby Road premises in Caister on Sea. Reynolds was Norfolk's oldest coach operator which closed at the end of July after more than 100 years in business. Owner Charles Reynolds has taken the decision to cease trading following ill health and has no successor to take it over. 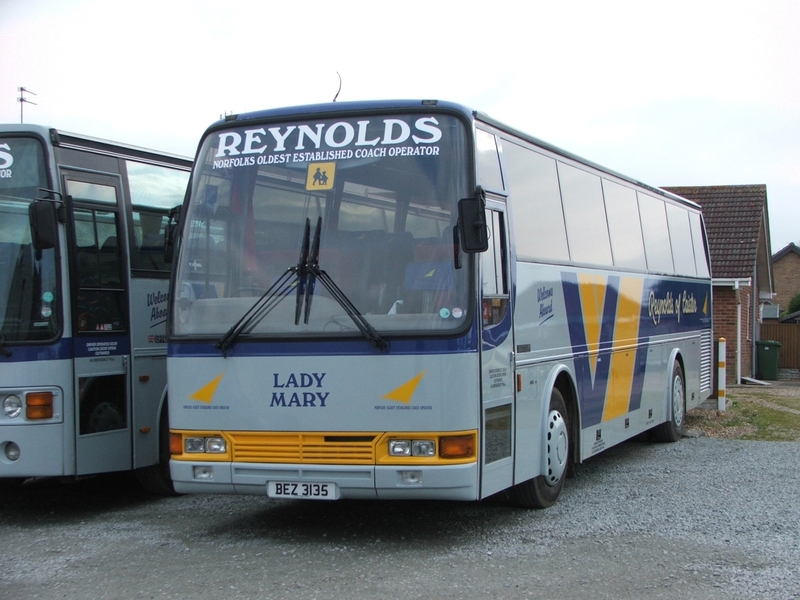 Reynolds Coaches employed a staff of 24 looking after its coach fleet all named after family members or specially nominated VIPs. With the help of Colin White, of the Eastern Transport Collection, a list of all the twenty coaches operated by Reynolds at closure can viewed in the Fleet Lists section of our blog. 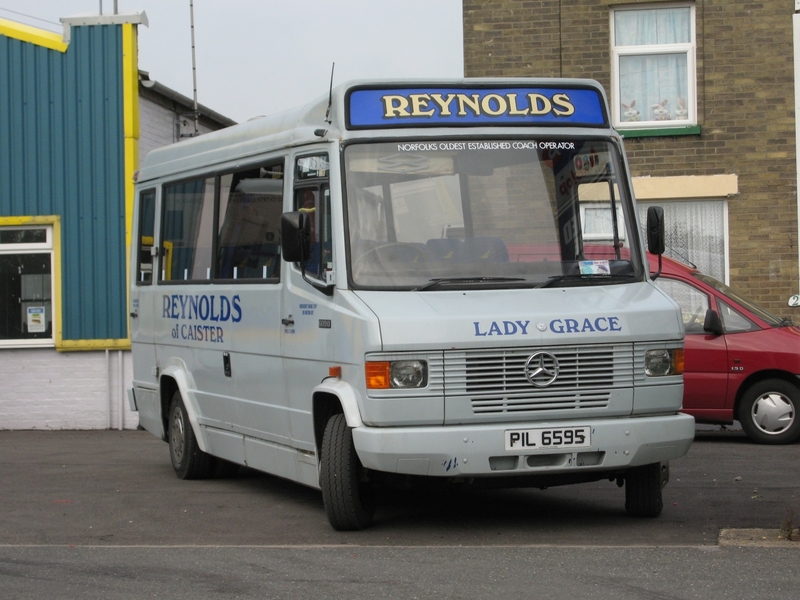 It seems inconceivable that the sight of a Reynolds coach in its distinctive livery will no longer be seen on the streets in the Great Yarmouth area. A quick visit to Gorleston High Street to get a few things during yesterday afternoon and whilst there I got these shots. My first is of Excel liveried First Eastern Counties Gemini 37578 AU58EDJ returning to Market Gates from Bradwell on the 6. Unfortunately nothing is shown on the front screen despite many efforts to get a photo showing the display. However, it can be confirmed by looking at the side destination next to the door entrance. You may remember from a fortnight ago I posted that First Volvo B12M 20514 WV02EUP has returned to Caister Road for driver training purposes. It was also seen yesterday on Church Lane turning into the High Street with L plates afixed. The final photo is of BorderBus 211 BB06BUS taking the same route to Great Yarmouth's Market Gates. It's the first time I have been able to get a photo of the Scania OmniCity in its new BorderBus livery. This morning's Notices & Proceedings Report, published by the East of England Traffic Commissioner, includes two entries of note. 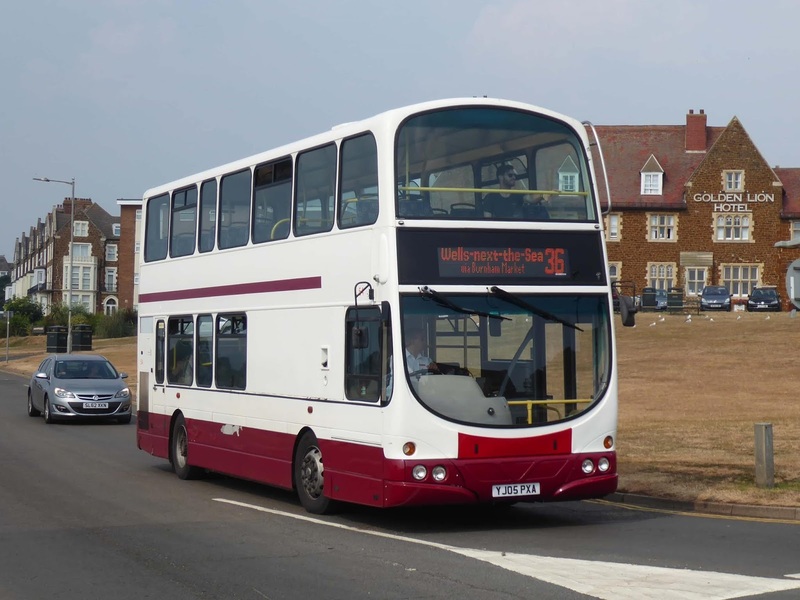 A double decker new to a Norfolk operator has returned to the county following a stint on the south coast. Wright bodied DAF DB250 YJ05PXA was new to Konectbus in May 2005 and was used on Norwich Park & Ride services. It is now back in the area with Lynx, Coastal Red following its acquisition from Compass Travel. Paul Copley saw it at Hunstanton, still in Compass colours, working the 36 service to Wells-next-the-Sea. My last sighting of it was during a visit to Compass Travel's Worthing Depot in February this year. It was taking some time off as the local schools were on half term holiday. My thanks to Paul for the information and photo. Sanders Service 6 between Great Yarmouth and North Walsham is normally operated by their fleet of Scania Omnicities or DAF/Wright single decks. Last week saw a couple of unusual vehicles operating the route. DAF/Berkhof YJ12CHK (806) was noted on Friday working the service and is seen above in the town centre. Later on my way home i then noted recent arrival SA60TWP (916) working the route in Caister. 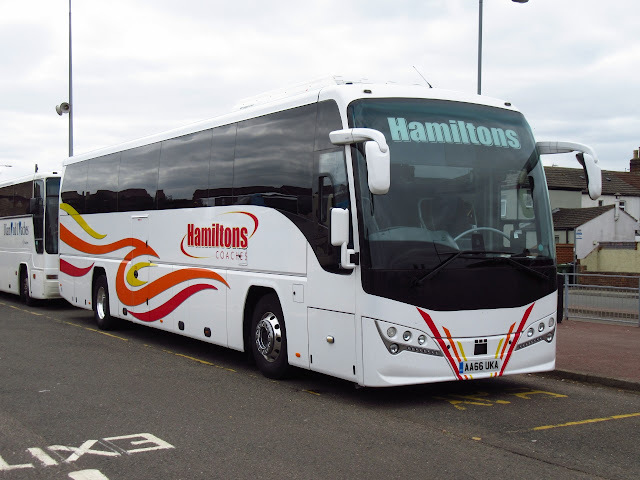 This is an ex Parks of Hamilton Volvo B9R Plaxton Elite and was registered new as KSK953. Thanks to Will Drake for the photo.